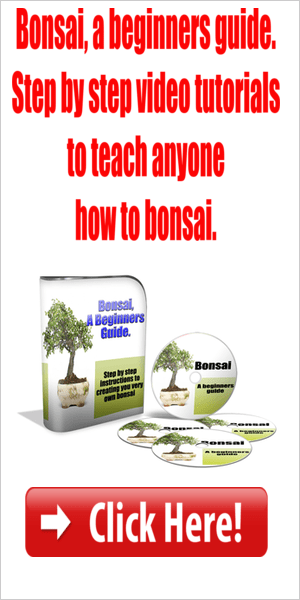 An important job necessary each year to ensure the health and vitality of a bonsai is root pruning and re-potting. The roots of a healthy tree will grow rapidly throughout the growing season filling the pot and compacting the soil and depleting it of nutrients. 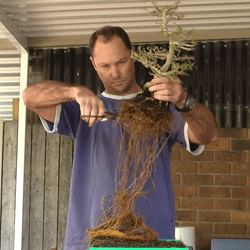 Root pruning and re-potting helps to create finer feeder roots and in turn finer more compact foliage, and it replaces the depleted soil with fresh soil that is airy and full of nutrients for the new forming roots to spread into and feed from. This can be a daunting job especially for beginners, and I must admit I still get a little nervous each year when I repot my own collection, even though I have had very few problems. 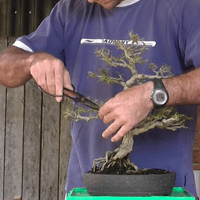 It’s probably more the thought of the process, (ripping a perfectly good tree from its pot, hacking off it’s roots and then sticking it back in the pot with a handful of new soil) rather than the process itself, which if done with care is extremely beneficial for the tree. The only time you will run into issues is if you do this at the wrong time of year and the after care is not thorough. Different tree varieties can vary as to when “the right time” to repot is, but the safest time to repot for the majority of trees is in early spring just before new growth starts to emerge. The most important thing is to be well prepared before beginning this job to make sure that your trees are not out of their pots for any longer than necessary or stressed due to excessive heat, being too dry or too cold (chance of frost etc.). Have all your tools, fresh soil, wire and watering setup all ready to go, I like to make sure my trees have been thoroughly watered somewhere within the last 12 hours before repotting to make sure they are also well hydrated. It is a good idea wherever possible to prune back some foliage on the tree before root pruning to help balance the ratio of foliage needing to be fed with the amount of roots that will be left after we have pruned the roots. This is not a hard and fast rule as it really only applies to trees that still have active foliage after winter i.e. evergreens. 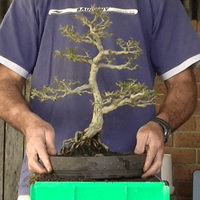 Before removing your tree from it’s pot check for any wiring that may become a problem, such as the tree still wired into it’s pot, or branches wired down and anchored somewhere that may get in the way. Remove any moss, rocks or pebbles from the soils surface and put aside as you may be able to re-use some of these if you wish. Once clear hold your tree at the thickest part of the trunk as low down as you can and gently extract it from its pot, put the pot to one side and get set up in a clear work area. Using a root rake or similar, start to tease out the roots working from the top, along the sides and underneath, loosening soil and lengthening out the roots. Some force may need to be applied, but only use necessary force to get the job done attempting to minimize as much un-necessary damage as possible. Once the majority of roots are teased out and soil has been loosened, use a sharp, clean pair of shears to remove around a third of the overall mass of roots. You may be putting the tree back into the same pot or at this time you may have chosen to change the pot, either way you need to prepare the pot the same. 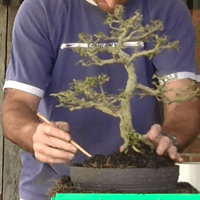 This is a chance to get the most visually appealing position for both your tree and your pot. If your tree is styled in anything other than a semi or full cascade then this is how it should be positioned. Find the centre line of your pot and place the tree slightly to the right or left on this centre line, you can tilt your tree (right or left) at this point to give it some character, and you may need to build up the soil a little to get a full view of any features of the roots and trunk base above the base of the pot, and make sure that the top of the tree leans slightly forward to the front. 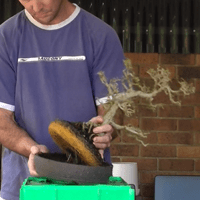 You can now wire your tree into the pot if required and begin replacing the soil. 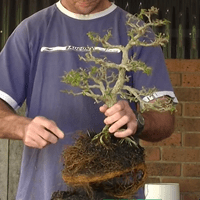 Start to replace the soil around your tree poking it in gently with a chopstick or similar. You want to make sure you are filling any air pockets around the roots with soil but not jamming in soil too hard as we want it loose enough for new roots to grow into. Once you have replaced all the soil, your tree is positioned correctly and held firmly in place, it’s time to thoroughly water it. It’s now important to make sure that all of the soil is now thoroughly watered. The best way to do this is to place the tree in a shallow container and slowly fill with water until it reaches the lip of the pot. You can spray the surface of the new soil until wet so it limits wash off, and then allow the tree to soak until it is wet right through. Replace any moss stones and pebbles, water surface again to wet down, remove from shallow watering container, place tree in a sheltered position gradually moving back to its usual spot. The main things to consider for the next few weeks is your tree is secure and not moving around in the pot from wind or other reasons, and that the soil does not stay too wet for too long. Both of these things will kill off new roots as they form and your tree will struggle to recover. Protect your tree from wind or where it can be bumped, and let the soil start to dry slightly before re-watering over the first couple of weeks or until fresh healthy new growth appears. Loved the video. But the article was very helpful and more though. The two together was great.